Homemade Italian Bread is incredibly easy to make! 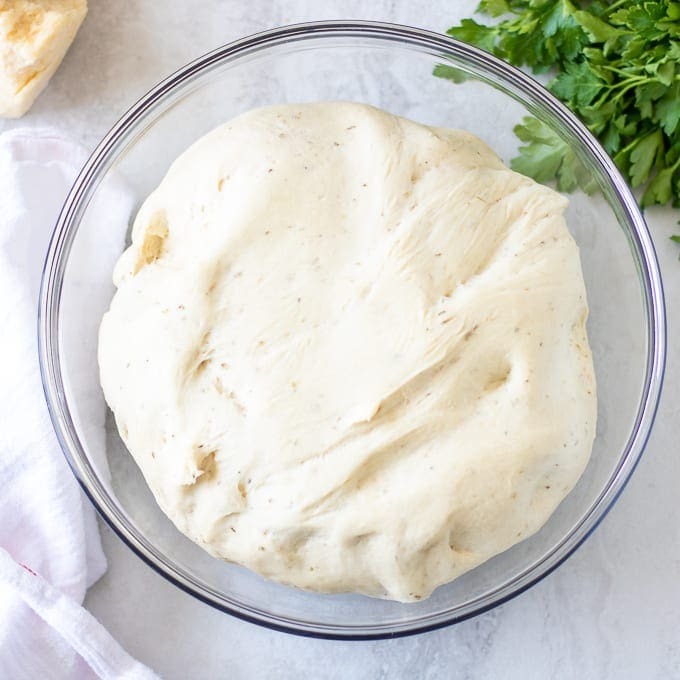 This simple recipe for Italian Bread is perfect to serve alongside soup, use as the base for garlic bread, or to use as sandwich bread. There is something about walking into a kitchen and smelling homemade bread baking. And while people can be intimidated with the thought of making homemade bread, this recipe for Italian Bread is incredibly simple to make. Italian Bread is made with simple ingredients and has a slightly crispy crust on the outside, but perfectly soft on the inside. 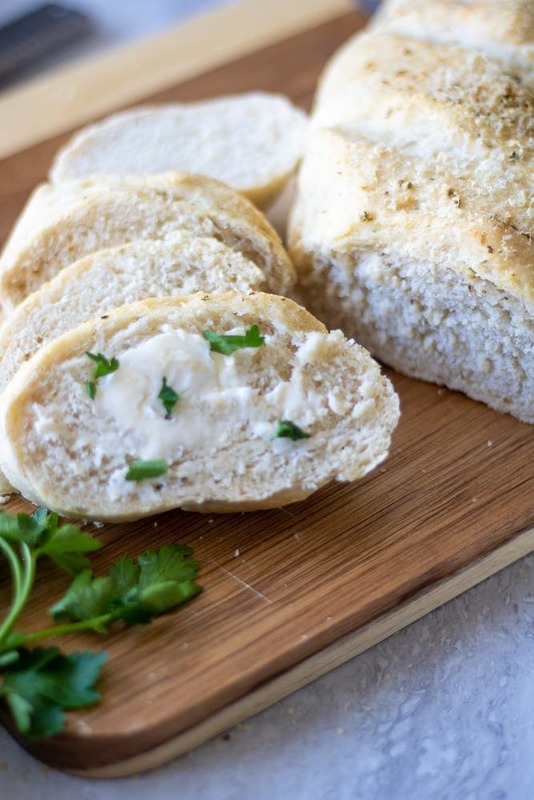 Italian bread is the perfect base for sandwiches, toast, grilled cheese, or garlic bread. Italian Bread dipped into homemade tomato sauce or infused olive oil is a bit of heaven and when toasted it plays a crucial role in Panzanella Salad. And frankly, Italian Bread is one of the easiest homemade bread recipes to make. Use unbleached bread flour for best results. Measure by lighting spooning flour into measuring cup to ensure accurate flour measurement. Be sure to use warm water that is at about 105 degrees. If water is too hot, the yeast will be killed. If water is too cold, the yeast will not be activated. Be sure yeast is not expired for best results. I like to add in dried oregano and garlic powder to give my Italian bread more flavor, but this is completely optional. 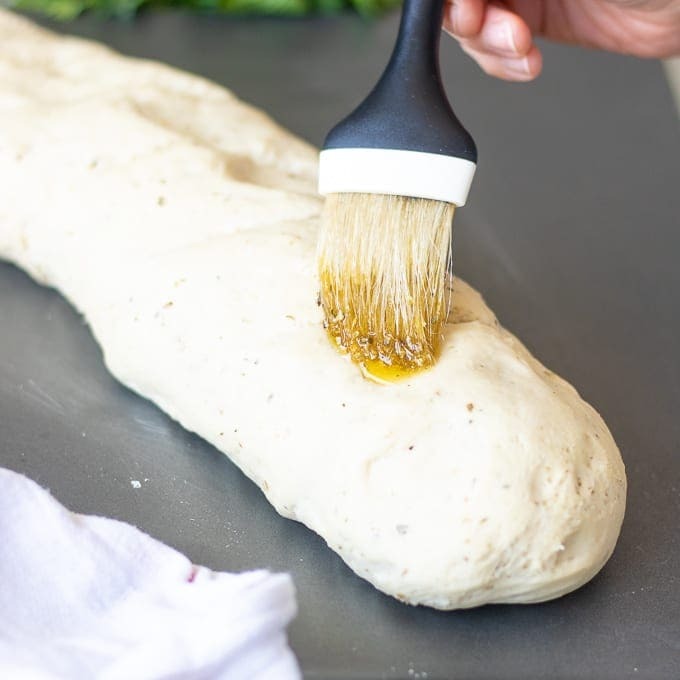 The process of making Italian bread uses basic pantry staple ingredients and is quite a simple process. It can be made by hand, with a stand mixer or in a bread machine. Secure loaf pan in bread machine. Pour warm water into pan. Make a well in flour and add yeast to well. Set bread machine to “dough” cycle. Sprinkle yeast over warm water. Let the yeast bloom in the water for 5-10 minutes, or until foamy. Stir in the foamy water with a wooden spoon until incorporated. Knead until dough is nice and smooth–about 10 minutes. Cover and let rise in warm place until double in size–about 1-2 hours depending on temperature of your house. In a measuring cup, sprinkle yeast over warm water. Mix the flour and salt together in stand mixing bowl. Pour in yeast water and mix together using mixing hook on stand mixer, until just combined. Remove mixing hook and attach dough hook. Knead until dough is nice and smooth–about 5 minutes. Place dough in oiled bowl and cover. Let rise in warm place until double in size–about 1-2 hours depending on temperature of your house. Once dough has doubled in size, punch dough dough and shape into long oval shape. Cut diagonal slits on top of bread every 2-3 inches. Cover Italian Bread Dough with kitchen towel and let rise for another 30 minutes. While bread is rising, heat oven to 350 degrees. After second rise, brush bread with olive oil. Bake until bread for 20-25 minutes. How do you know when bread is fully baked? Bread is finished baking when you tap the bottom of the loaf of bread and it sounds hollow. But a sure fire way to know your bread is baked perfectly, is to take it’s internal temperature. Place thermometer in center or bread. When it reads 190 degrees, your Italian Bread is baked to perfection. 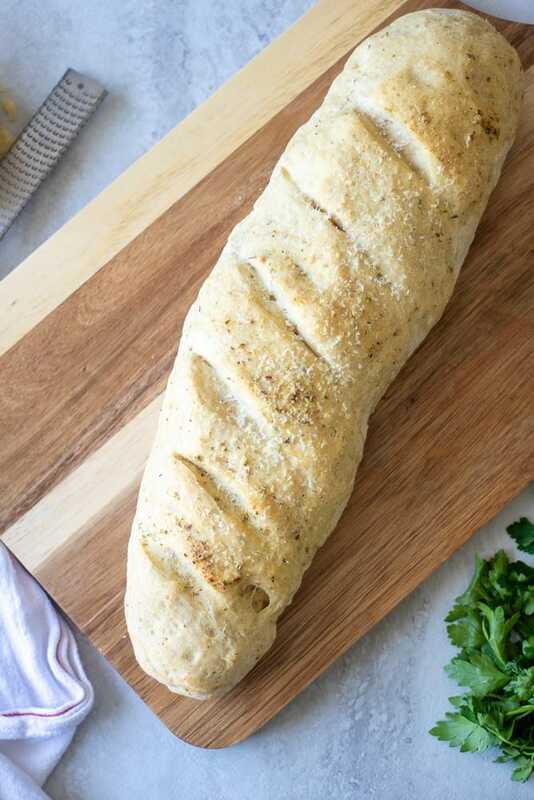 Easy homemade Italian bread infused with garlic and Italian seasonings. Place ingredients through yeast into bread machine in order specified by your machine (liquids first or last)and set to dough cycle. If you are making by hand, let the yeast bloom in the water for 5-10 minutes. Mix the flour and salt together and stir in the foamy water with a wooden spoon until incorporated. Knead until dough is nice and smooth--about 5 minutes. And then set in warm place covered by moist towel to rise until doubled in size--about 1-2 hours depending on temperature of your house. Once dough is ready, divide in half and roll out into a long ovalish shape. Spread each half with 1-2 tablespoons of olive oil each and evenly distribute with kosher salt and pepper. Sprinkle each half with 1 teaspoon oregano and 1 1/2 teaspoons garlic powder. Sprinkle with cheese if desired. 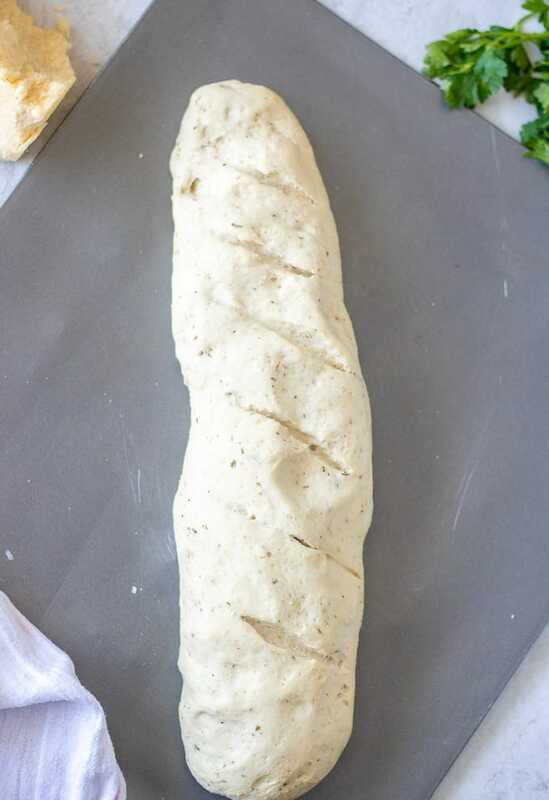 Roll the dough up into a long log like shape. Brush with an egg wash or additional olive oil. Sprinkle remaining oregano and olive oil over bread. I’ve been trying to give up eating bread, but I don’t think I’ll be 100% successful I love it too much. This recipe has me sorely tempted. I give up. I’m baking it, since it’s raining today. This was such an easy recipe to make, thank you for including so many tips to make the process fool-proof! Can’t wait to make it again! I just love a good bread recipe! This came out great! I love hearing that April!